Part two of the Shaping the Sabres series centers around the entry draft in Sunrise, FL. Chris: With our predraft trades locked away, that brings us to the draft table in Sunrise. I’d love to manufacture a deal using Buffalo’s other high picks and a prospect or two to grab an NHL-ready right winger. However, I’m unsure that the 21st and 31st picks along with a combination of prospects could land the type of top-six talent the Sabres need. For example, players like Nino Niederretier and Wayne Simmonds are highly valued assets who are vital pieces for their respective franchises. Even including a prospect like Hudson Fasching or Justin Bailey wouldn’t likely get such a deal done, and adding anything else would make the offer from the Buffalo end far too lopsided. But that would still be the first avenue I explore. Assuming any wingers worth chasing are out of the question, there are two players in the draft not named McDavid or Eichel who I am very high on: Timo Meier and Zach Werenski. 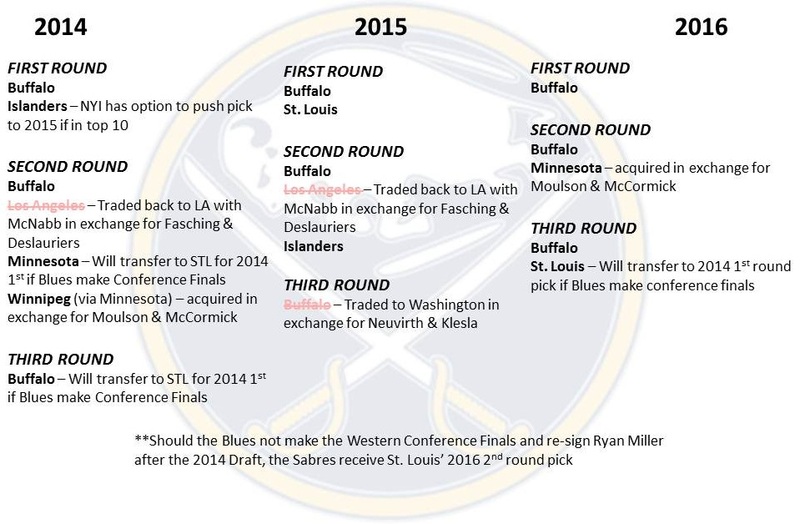 The proposal and players Chris would target at the Sabres’ draft table. Meier was a late riser who posted 90 points with Halifax this year while Werenski was dynamic as a freshman at Michigan. Werenski will need to slip to at least ninth or tenth overall to be an option for the Sabres while Meier has been pegged anywhere from eight or nine to the mid-teens. I’d take the guess work out of the equation and ship a package including the 21st and 31st picks to Colorado to secure the 10th pick. I’d even include an additional pick – perhaps a 3rd in 2016 – to help grease the rails. Picking between the two (specifically Meier and Werenski) would be a mighty challenge. The organizational need for defensemen is obvious and grabbing a swift skating, left handed puck mover like Werenski would see me drafting for need and talent. This is the first part of a three-part project in which Tyler and Chris discuss the moves they make if they occupied the general manager’s role with the Buffalo Sabres. The draft is two weeks away and the Sabres rebuild will truly be in full swing when Tim Murray walks to the podium and announces Jack Eichel as the second overall pick. With that in mind we thought it would be interesting to deviate from the typical GM for a day articles and offer up our own version. Tyler and Chris will be going back and forth with our own plans for how we’d go about building the roster as the draft approaches. The rules are simple, free agency, trades (of players and picks) and buyouts are all on the table and nothing is assumed. So if either of us sees Dylan Strome as the preferred number two pick, so be it. The one thing we won’t be doing is mocking the entire Sabres draft. So short of noting which players we like at 2, 21, 31 and 51, don’t expect to see much more beyond that. Otherwise we have a blank slate and blank checks signed by Uncle Terry himself. The 2014-15 trade deadline was much different for Tim Murray than the 2013-14 deadline when he was just a few months into his new job. Entering last year’s deadline, Murray was tasked with finding a home for pending UFA goaltender Ryan Miller, pending UFA Steve Ott along with other pieces. Most notably, Matt Moulson, who was also set to enter free agency. Last year’s deadline saw Murray make four separate deals and acquire a total of six players and four draft picks. He also claimed Cory Conacher on waivers on deadline day. Murray was not facing the same steep challenge at this year’s deadline. He did not have a franchise talent like Miller to deal, while sporting three pending UFAs who held varying levels of average value. The deadline closed with the Sabres having made four trades (again) while acquiring a goaltender, a prospect and four picks. With the lottery balls still left to be pulled, there are very few positions in the Sabres organization that have an immediate need to be addressed for both the short and long-term. 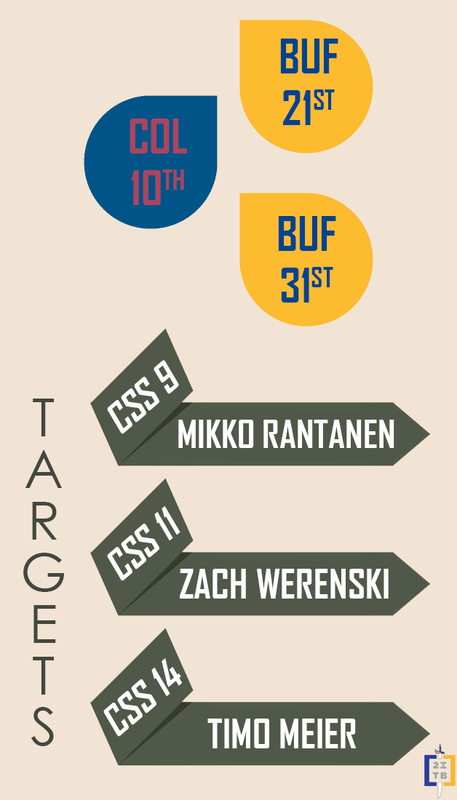 In fact, you could argue that the Sabres’ pipeline is well stocked at nearly every position. The one area that needs attention, particularly in the near future, is goaltender. 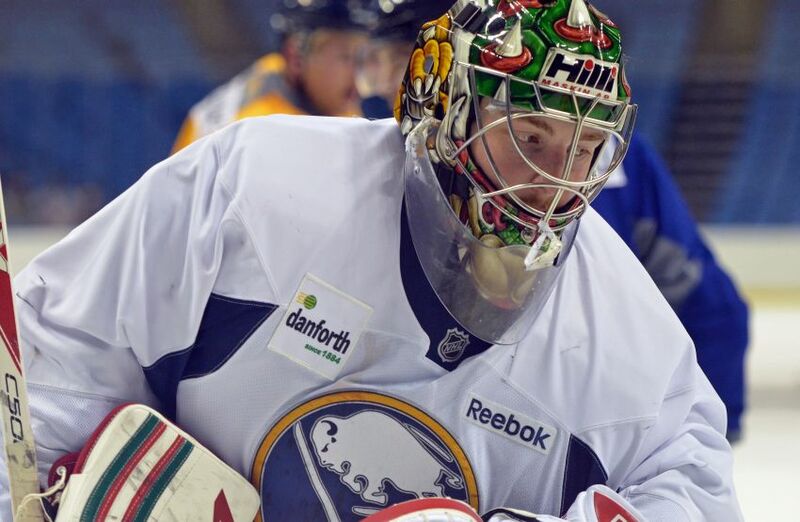 While the Sabres have a number of quality goaltending prospects, including four who are at least a year away from their professional debuts, they’re short on NHL-ready talent between the pipes. The recent trade of Jhonas Enroth, while a good decision, demonstrates the shallow depth the Sabres have atop their goaltending pipeline. While Linus Ullmark, Jonas Johansson and Cal Petersen provide a fair bit of long-term stability from a development standpoint, only Ullmark is under contract at this time. Further, Ullmark will be making his North American debut next year, meaning he is at least two years away from being truly prepared for significant NHL action while the others in the pipeline are still a year or longer away from getting an NHL contract, let along professional playing time. There is a gap between where the team is expected to be in the coming years and the earliest point you can hope Ullmark makes a serious impact at the NHL level. That means one of two things for Tim Murray and the Sabres. They can either sign a veteran free agent to serve as a bridge for the organization or they can work to trade for another young, promising goaltender who’s further along the development track. The former option may be unavoidable as there is a very good chance that Murray needs to look past Michal Neuvirth as his answer in net regardless of his long-term plans. Where are the Sabres picks? 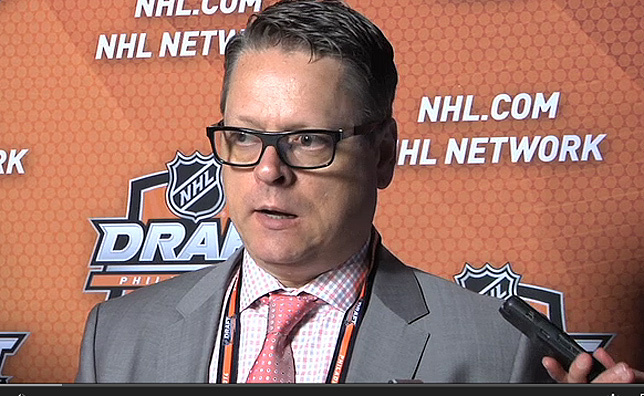 Tim Murray was awfully busy in the past week starting on Friday when he moved Ryan Miller and Steve Ott to St. Louis. That started the ball rolling for Murray’s first trade deadline as a general manager and when the dust settled the Sabres had made four moves involving 15 players and prospects and seven draft picks. Things may have gotten particularly cloudy with the draft picks as the Sabres not only shipped out three on Wednesday, but have also acquired quite a few over the next few seasons in trades dating back to last year’s swap with Minnesota. A number of these picks are also controlled by various trade conditions that could drastically change the landscape of what the Sabres own in the 2014 draft and beyond. For example, should the Islanders choose to keep their first round selection in this year’s draft – a condition that stipulates the pick must be in the top-10 – the pick will transfer to the 2015 draft. Should that occur the Sabres will own three first round selections (barring any trades) in what is expected to be a deep first round. The Sabres could also score an extra pick in this year’s first round if the Blues reach the conference finals or choose to re-sign Ryan Miller prior to the draft. Given that the Blues were knocked out in the second round last year, it doesn’t seem like a stretch to think that is a possibility. However, if the Sabres are to receive that pick, the Blues will get Buffalo’s third round selection in 2014 along with the second round pick Buffalo obtained in the Jason Pominville trade last year. If the Blues miss the conference finals and happen to re-sign Miller after the draft, Buffalo winds up with St. Louis’ 2016 second round pick. Confused yet? In order to provide some clarity on the situation, here’s a graphic on what picks the Sabres own and what picks have been moved. Feel free to point out any errors.